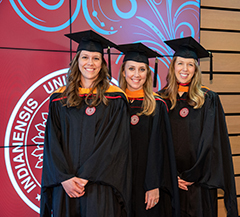 In its 43rd year, Indiana University East’s School of Nursing and Health Sciences has a proven track record of success, with its graduates providing the proof. A few of its successful alumni include leaders in local hospitals, such as Kelly Beall, a vice president at Reid Health. Some graduates are leading the instruction of future nurses, such as Heather Wierzbinski-Cross, who is dean of the School of Nursing at Ivy Tech Community College in Richmond. Others find leadership positions in health care where they are able to benefit large numbers of patients from all over the country. LuAnne Christofaro, the former executive director of nursing at Reid Health, recently became a Hospital Improvement Innovation Network advisor at Vizient, Inc., which is the nation’s largest member-owned health care services company. The Hospital Improvement Innovation Network (HIIN) is a nationwide effort to reduce preventable hospital-acquired conditions and hospital readmissions. Christofaro said she is very grateful that the IU East School of Nursing and Health Sciences was available in Richmond when she graduated from high school. Without the regional campus, she may not have been able to achieve her goal. IU East then offered an associate degree that allowed her to get through school quickly and enter the working world and start earning money. “I liked having a smaller class size and also knowing the nursing faculty on a more individual basis,” Christofaro said. Soon after receiving her nursing license, Christofaro was able to pursue a bachelor’s degree while working and getting real-life experience, thanks to IU East’s convenient location to her job and home. She said it was very helpful to receive tuition reimbursement for some of her educational expenses through her employer. Once she completed her bachelor’s degree, she was able to proceed right away with her master’s degree. While the whole master’s degree was not yet available then on the IU East campus, she could get most of her prerequisites completed locally. She said IU East offered her the chance to get high-quality degrees that also gave her the necessary skills to help her provide for her family and serve this community in many positive ways. Christofaro said she has always held IU East, and specifically the nursing program, in very high regard. She said she believes IU East is staying current and relevant to the job skills that are needed in today’s challenging health care environment. Christofaro cites the recent addition of a master’s degree in nursing education as well as family nurse practitioner, saying both of those specialties are in high demand, ensuring graduates do not have any difficulty finding a job upon graduation. She said the community also benefits by having someone fill a role that will help residents’ overall health and welfare. Before pursuing a career in health care, Don Day Jr. was employed at Belden in Richmond. Day, chief nursing officer and vice president of Patient Care Services for Fayette Regional Health System, said he realized he didn’t want to work in manufacturing the rest of his life. “I was actually doing a lot of weight lifting and wanted to use what I had learned along the way to take care of people,” Day said. The then-Centerville, Indiana, resident signed up for the B.S.N. nursing program for a couple different reasons. He said he knew that if he was able to work in the factory full-time and go to school full-time, he could do it. IU East offered classes that met his schedule at work, and he was also able to change shifts at Belden to meet the school schedule when needed. “The doors of life just began opening for me and I walked through,” he said. Day said IU East staff met him where he was as a non-traditional student, in terms of motivating him to do a good job and always be prepared for clinicals. He said he wasn’t afraid to ask for more things to do in the clinical setting. Day did not have the advantage of working in health care as a student because he was one of the incomes in the household, so the clinical setting had to be where he learned nursing skills. Day said instructors also helped him grow as a leader in the program, as he was the president of the Student Nursing society. The extra projects and community service they accomplished as a team of students were outstanding, he remembers. That dedication to patient care led to Day’s first nursing job at Ball Memorial Hospital in Muncie, where he started on the Telemetry floor as a critical care nurse. He later joined the Reid Health team as a critical care nurse in the Intensive Care Unit (ICU) and also worked as the Learning Lab Coordinator for IU East’s School of Nursing. After working at Reid for a few years, Day moved forward as a house supervisor on evening shift. Over the course of nine years, he also worked in the education department, and as the unit director of a medical/surgical unit and finally the medical oncology unit. In 2007, Day moved his family to Scottsdale, Arizona, to work for Scottsdale Health Care as the clinical director of the Medical Oncology unit, the over flow unit, the vascular access team, and the administrative representatives. Last fall, Day said he was called home to Indiana to help with Fayette Regional Health System’s new detox unit and to assist in creating a culture of caring in Connersville. “The passion that I have for those who suffer from substance use disorder and helping to create a solution for them at Fayette, was the calling that has brought me home,” Day said. Day remains proud of his local nursing education. Part IV of this four-part series will be published Tuesday, October 16. Read online at iue.edu/nursingalumni.